The Agony in the Garden, or Christ on the Mount of Olives, is a subject in art that depicts Jesus praying in Gethsemane the night of his arrest. Typically, he is shown looking upward in grave distress, with pleading hands, while his disciples lie asleep in the foreground—an act of supreme negligence that implicates us as fellow disciples. The approach to the subject taken in the Book of Kells, however, is vastly different. In an imaginative revisioning of the Bible’s account of that night, the artist shows two companions supporting Jesus is his agony, holding up his arms in the orans prayer stance. Rather than calling the early disciples or us to shame for our frequent failure to “watch and pray” for and with our brothers and sisters who suffer, the picture shows us what it looks like to stand firm in prayer alongside them. To the Irish monks for whom this illuminated Gospel book was intended, the image was a warning against solitariness in their spiritual life. Of course, the image is not a strict interpretation of Matthew 26 (verse 30 of which is printed in the lunette above Christ’s head), but rather incorporates elements from another notable biblical narrative: Israel’s battle against the Amalekites (Exodus 17:8–16). As the nation encounters its first attack en route to the Promised Land, Moses realizes that as long as he holds his arms up, clenching the staff of God, Israel prevails on the battlefield. So as Joshua and his ragtag army go at it against the enemy, Moses plants himself on a hill with his arms raised. Inevitably, his arms grow slack, and when they do, Aaron and Hur come to bear them back up; they stand faithfully by, lending their strength all the way to victory. Peter, James, and John’s lack of attentiveness during Christ’s inner battle in Gethsemane serves as a foil to the attentiveness of Aaron and Hur during Israel’s literal fight against the Amalekites. Drawn together by the artist of this Kells folio, these two stories bespeak the importance of community, of organized resistance against the wiles of Satan—especially through steadfast prayer. Sometimes we will become weary in well doing. Sometimes we will be forced to enter our own little Gethsemanes, where we are tempted to despair. Alone, it would be easy to succumb. That’s why we need the hands of Aaron and Hur: to help us stay constant, to bolster us up. Ultimately, though, the victory comes from God. Aaron and Hur provided much-needed assistance during Israel’s first battle, but the staff of God worked the miracle, which led Moses to declare, “The Lord is my banner!” And in Jesus’s darkest hour of suffering, when not a friend was to be found, God sent angels to provide him with comfort and care; their gentle presence helped him push through his doubts toward his destiny. That still doesn’t negate the strengthening influence of friends. God’s design for humanity, of which the church should be a picture, is that we bear one another up through struggles and sorrows and even through the good times, maintaining a collective defensive stance against the evil one so as to avoid capture in his net of sin, or worse, defection. When we stand in solidarity with our brothers and sisters, spiritual victory becomes a distinct likelihood. Christ on the Mount of Olives, fol. 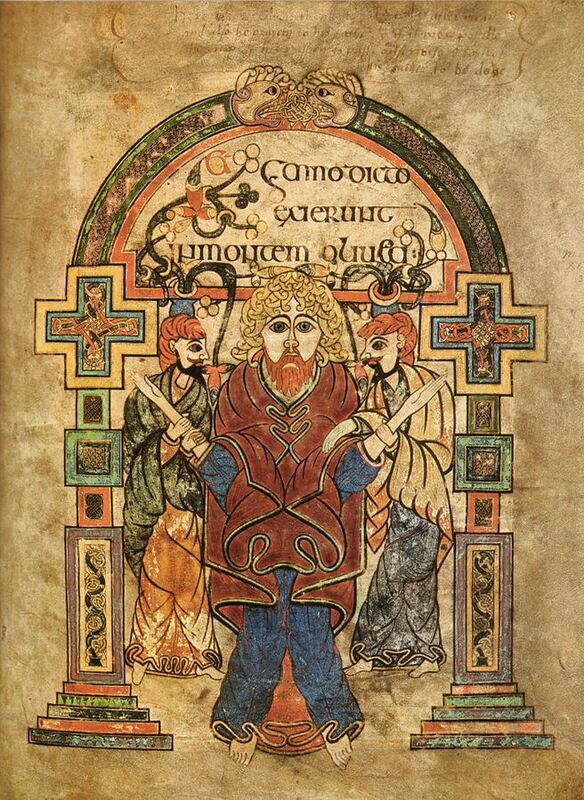 114v from the Book of Kells, early 9th century, Ireland. Victoria Emily Jones lives in the Baltimore area in the USA, where she works as an editorial freelancer and blogs on http://artandtheology.org/. Her educational background is in journalism, English literature, and music, but her current research focuses on ways in which the visual arts can stimulate renewed theological engagement with the Bible. She is in the process of developing an online biblical art gallery, a selective collection of artworks from all eras that engage with specific texts of scripture.